Church Of Sound is back from its summer hiatus with an event that means a lot to us. We had been thinking to do the Bobby Hutcherson songbook for a while, but his recent passing urged us to make it happen and give his music the homage it deserves. To cover this amazing repertoire, we have got the immense honor to welcome the great Vibe and Marimba player Orphy Robinson. 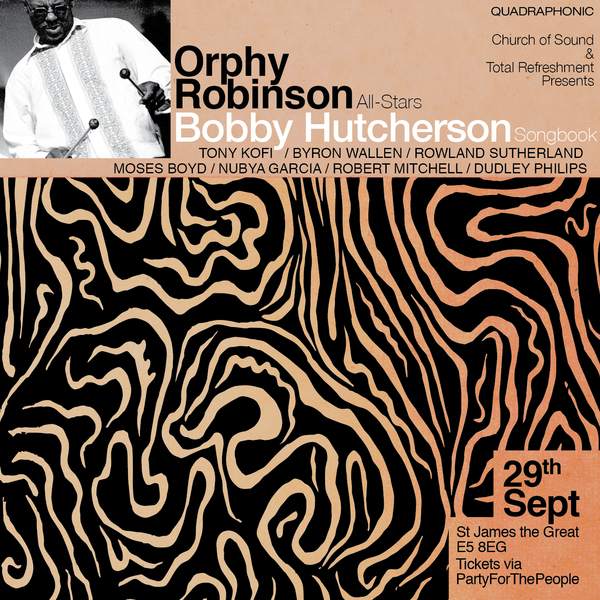 Because Bobby Hutcherson’s repertoire is so vast and varied we thought that one set of covers wouldn’t do it justice, so we will have two 45 minute sets covering some of his best tunes. The tunes that we have selected are mainly from the Blue Note catalogue, either as a leader or sideman. The albums we looked at were ‘Components’, ‘Stick up!’ , ‘San Francisco’,’Montara’, Knucklebean’ and more. We will announce the track listing closer to the date. Curator for this show, Lexus Blondin will be spinning records before, during & after bands. We will be serving food from the start, so don't hesitate to come early to get in the mood. All proceeds from the booking fees will be going to Calais Action, via Party for the People. The Church Of Sound team.